The Nividia GeForce GTS 250M is a DirectX 10.1 graphics adapter for notebooks based on the 40nm GT215 core. It features 96 shader cores as the 9800M GT, but the memory bus is only 128 bit wide. To compensate this, the GTS 250M supports GDDR5. With DDR3 graphics memory the performance is only a a bit above the Mobility Radeon HD 4670. 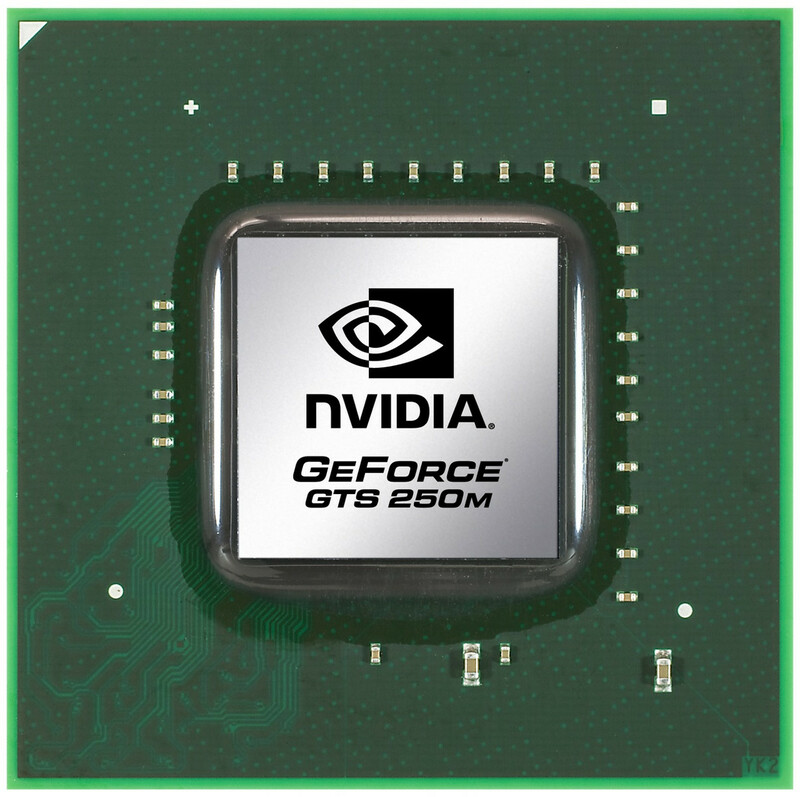 The core of the GTS250M is internally called GT215 and according to Nvidia based on the current high-end desktop architecture (GTX 200 series). Furthermore, Nvidia has improved the micro-architecture for further power saving and performance increases. Therefore, the performance per shader unit should be slightly improved compared to the previous generation. As the GeForce 9800M GT, the GTS 250M features 96 stream processors that do the work of the former dedicated pixel- and vertex-shaders. The unified shaders of Nvidia are 1-dimensional (AMD has 5-dimensional shaders which leads to the higher number of shaders). The GeForce GTS250M also supports CUDA, DirectX Compute, OpenCL, and PhysiX to use the shaders for other tasks than rendering images (like encoding videos, calculating the physics of a game or mathematical tasks). For these special tasks, the GPU can be noticeably faster than current CPUs. In conjunction with a chipset from Nvidia with integrated graphics (e.g. 9400M), the GTS 250M supports Hybrid-SLI (HybridPower and GeForceBoost). HybridPower is a technique to choose between the integrated and dedicated graphics core, if performance or battery runtime is needed. This works only in Windows Vista (and possibly Windows 7). Up to now the user has to use a tool to switch between the GPUs. Later Nvidia wants to switch automatically in the drivers. GeForceBoost is not supported by the GTS 250M because the SLI combination would not perform better. The performance of the middle class to high end gpu GeForce GTS 250M should be clearly above the GT 240M because of it features twice as much shader cores. Demanding DirectX 10 games like Crysis should run fluently in medium to high details. Older or less demanding games should run in high detail settings and high resolutions. Depending on the the used type of graphics memory (GDDR5, GDDR3) the performance may differ. The power consumption of the mobile graphics card is with 27 Watt TDP relativley low (especially as the GTS 260M which is a bit higher clocked needs 10 Watt more). Furthermore, according to Nvidia, the new improved core does only need half of the power in Idle mode (compared to the previous generation). Compared to desktop graphics cards, the GeForce GTS 250M is similar to the GeForce GT 220. The desktop GPU is higher clocked (625/1360/500-1000) and therefore should be faster in games. The Nividia GeForce GTS 260M is a DirectX 10.1 graphics adapter for notebooks based on the 40nm GT215 core. It features 96 shader cores as the 9800M GT, but the memory bus is only 128 bit wide. To compensate, the certain models of the GTS 260M support faster GDDR5 VRAM. Essentially, the GTS 260M is a higher clocked GeForce GTS 250M, but with a much higher power consumption (TDP) of 38 Watt. The core of the GTS 260M is a GT215 based on the related desktop architecture (GTX 200 series). Compared to previous generations, Nvidia has improved the micro-architecture for further power-saving and performance increases. Therefore, the performance per shader unit of the GeForce card should be at least slightly better than older cards. As with the GeForce 9800M GT, the GeForce GTS 260M features 96 stream processors that perform the graphics workload previously done by dedicated pixel- and vertex-shaders. The unified shaders of Nvidia are 1-dimensional vs. 5-dimensional shaders from AMD GPUs. As a result, graphics card between Nvidia and AMD Radeon cannot be directly compared by pure core count. The GeForce GPU also supports CUDA, DirectX Compute, OpenCL and PhysX for tasks other than rendering images. For example, demanding processes like video encoding, physics calculations or mathematical tasks can be done noticeably faster with GPU stream processors compared to certain CPUs. The mobile Nvidia graphics card has a built in video decoder called PureVideo HD with Video Processor 4 (VP4). Thus, the GPU supports the full decoding of H.264, VC-1, and now also MPEG-4 ASP (e.g. DivX or XviD). MPEG-1 is still not supported, but the decoding of this codec is quite trivial on a CPU. In conjunction with the integrated Nvidia graphics (e.g. 9400M), the GTS 260M supports Hybrid-SLI (HybridPower and GeForceBoost). HybridPower is a Windows Vista-only technique for choosing between the integrated and dedicated graphics core for power-saving purposes. The technology was eventually superseded by Optimus, which allows for automatic graphics switching through drivers. GeForceBoost is not supported by the GTS 260M because the SLI combination with the integrated GPU would provide no significant performance gains. The performance of the relatively powerful GeForce GTS 260M should be slightly above the GTS 250M because of the higher clock speed. Demanding DirectX 10 games, such as Crysis, should run fluently in medium to high details. Older or less demanding games should run fluently in both high detail settings and resolutions. Depending on the the used type of graphics memory (GDDR5 or GDDR3), the performance may differ between models and makes of the GTS 260M. The power consumption of the Nvidia GPU is about 38 Watt TDP, which is significantly higher than the GTS 250M with only a 27 Watt TDP maximum. According to Nvidia, however, GPUs from the 200M series demand only half of the power when in Idle mode compared to the previous generation of Nvidia cards. As far as we know, the GTS 260M was never utilized in a laptop, although the GPU was later refreshed and renamed to the Nvidia GeForce GTS 360M with a slightly higher core clock speeds.